Welcome to the electronic book store page for Fitting Lifes Pieces Together Volume 3 on www.self-esteem-enhances-life.com! In the US use:Feel free to view this ebook on Amazon right now! In the UK use:Feel free to view this ebook on Amazon right now! Inspirational and motivational quotes and verses to assist you in meeting life's challenges, adapting to and embracing change, making better decisions, raising self esteem and understanding yourself and life better. 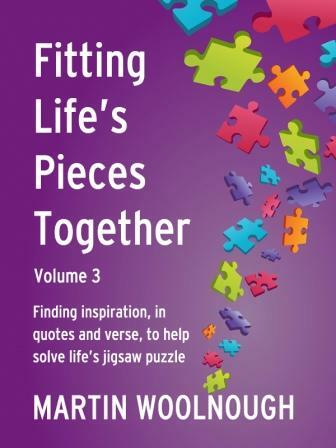 Fitting Lifes Pieces Together Volume 3 is about seeing how the different elements of the jigsaw puzzle that we call life can be brought together. We all want to enjoy life and find satisfaction and contentment in our days and the things that we decide to do. We have untold wisdom, knowledge and experience, we just need to let this come out . . . When you view the Fitting Lifes Pieces Together Volume 3 ebook on Amazon you will be able to 'click to look inside' and get a small flavor of what the book is about. But here are two further extracts for you. Man is preceded by forest, followed by desert. The sure way of knowing nothing about life is to try to make oneself useful. when will we care to change, when will we dare? we should change, but when oh when my dear? how can we change if we don't do anything to prepare? while I am young still - and not been placed in day-care. Dedication involves making the space to let young ideas take hold; every tree was once a seed and every company was once an idea. Please realize you do not need a Kindle reader, you can read Kindle ebooks on Windows PC, Mac, iPhone, iPad and Android. Learn more here! This site is for information purposes only. It is not intended to diagnose or treat any medical condition. Please use the information responsibly. If in any doubt consult a qualified medical professional. Copyright© 2008-17. Self-Esteem-Enhances-Life.com. All Rights Reserved.